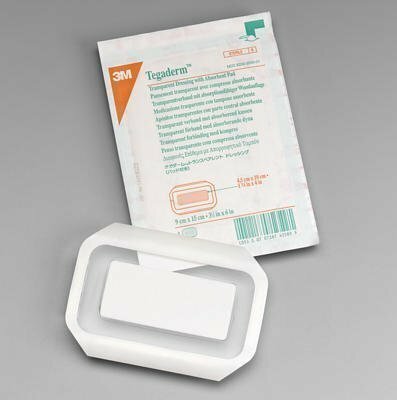 3M Healthcare Tegaderm Film Dressing with Non-adherent Pad 2-3/8" x 4", Water-proof, Sterile 3M Tegaderm Pad Film Dressing with Non-adherent Pad helps prevent external bacteria from entering the site. With the unique Picture Frame delivery system, it make it quick and easy to achieve a precise, secure placement of the dressing every time, reducing application time. This conformable dressing is easy to apply, and stretches with the skin to promote longer wear time. 3M Tegaderm Pad Film Dressing with Non-adherent Pad will not stick to wound.